Anne Graham Lotz with her husband, Danny Lotz, at a public event in North Carolina. Photo courtesy of the Durham Herald-Sun. 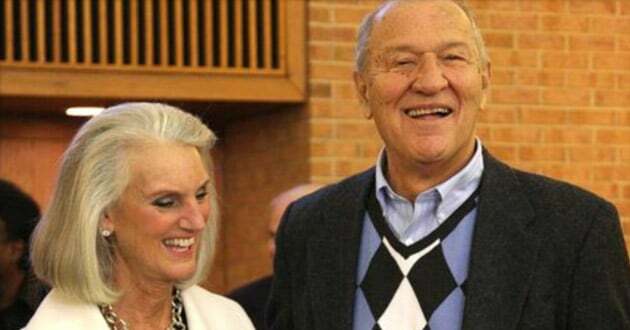 Danny Lotz, the husband of Bible teacher Anne Graham Lotz, died Wednesday (Aug. 19) in a Raleigh, N.C., hospital after he was found unconscious in a swimming pool outside his home on Monday. Lotz, 78, was a devoted Christian, a college basketball star and a dentist. But he was perhaps best known as the husband of Anne Graham Lotz and the son-in-law of the Rev. Billy Graham, Anne’s father. Lotz had been in failing health for many years. His diabetes diagnosis at age 50 was the beginning of many physical trials; he lost his sight in one eye and his hearing in one ear and required three dialysis treatments per week. “He never complained, never slowed down, never gave up, never stopped investing in the lives of others,” his wife wrote on the website of AnGeL Ministries. The son of a minister from New York state, he came to North Carolina as a promising college basketball player. At 6 feet 6 inches tall, he helped the University of North Carolina win the national championship in 1957. During his first year of dental school he played football at UNC. He later helped start the first chapter of the Fellowship of Christian Athletes in North Carolina. His devotion to collegiate athletics was unwavering. This past Sunday (Aug. 16), he and his wife attended a Chapel Hill church service for the UNC women’s basketball team. After serving for two years in the Air Force, he was introduced to Anne Graham, one of Billy and Ruth Graham’s five children, and the two were married in 1966. They have three children. He practiced dentistry for many years, led popular men’s Bible studies in Raleigh and Chapel Hill and helped found two Southern Baptist Convention-affiliated churches. No funeral arrangements were immediately available.